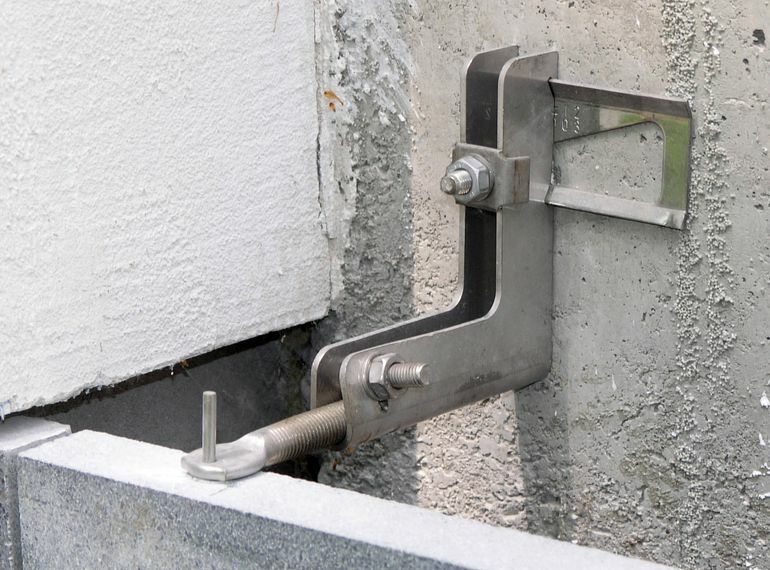 The HALFEN Body anchors are 3D adjustable brackets for wall panels made of natural stone or concrete, which are fixed to the load-bearing structure using HALFEN channels or approved HALFEN bolts. The key benefits of Body anchors are that they are suitable for a stand-off distance of 30-330 mm with a load capacity up to 1300 N in the standard version. 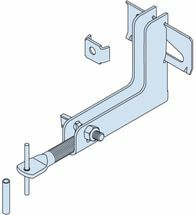 These can be used in horizontal and vertical joints and, above all, their immediate load-bearing capacity, which means work can be progressed quickly. The monitoring and certification authority of the LGA (Bavarian state trade institute) Nuremberg awarded the quality certificate "LGA tested Quality" to HALFEN Body anchors. The quality certificate is the first independent seal of quality for the production and design of such cladding systems. 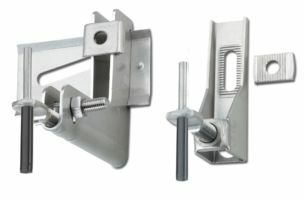 Depending on the model, the HALFEN Body anchor carries both vertical loads from the panel weight and horizontal loads, for example, from the wind. Depending on the building situation, you can choose from four different models of HALFEN Body anchor. HALFEN BA Body anchors are designed for small stand-off distances from 60 to 120mm with a maximum load of 1300N. 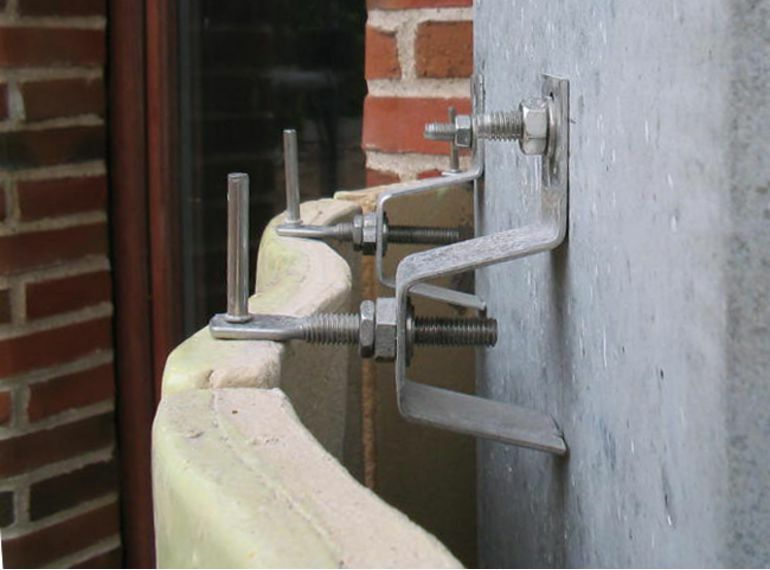 The anchors consist of a sturdy base element, a serrated plate and a spade bolt. 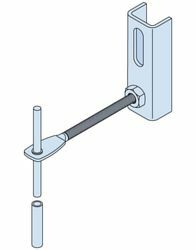 The BA Body anchor is fixed according to the installation instructions, either in the horizontal or vertical panel joint, to load-bearing substrate to HALFEN Cast-in channels or using HALFEN Anchor bolt systems. 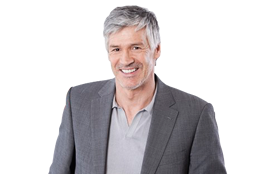 The bracket has a vertical 8.5 × 28mm slot and a serrated plate for easy height-adjustment. As with all body anchors the distance to the load-bearing substrate is adjusted by turning the spade bolt. 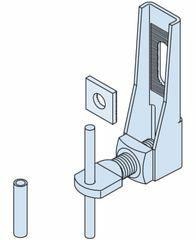 The anchor bracket can of course be adjusted laterally by swivelling around the fixing bolt. 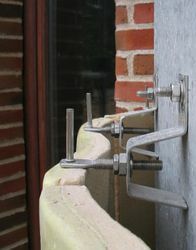 distance from the main structure is adjusted using the spade bolt. which is secured to the body with a locking nut.